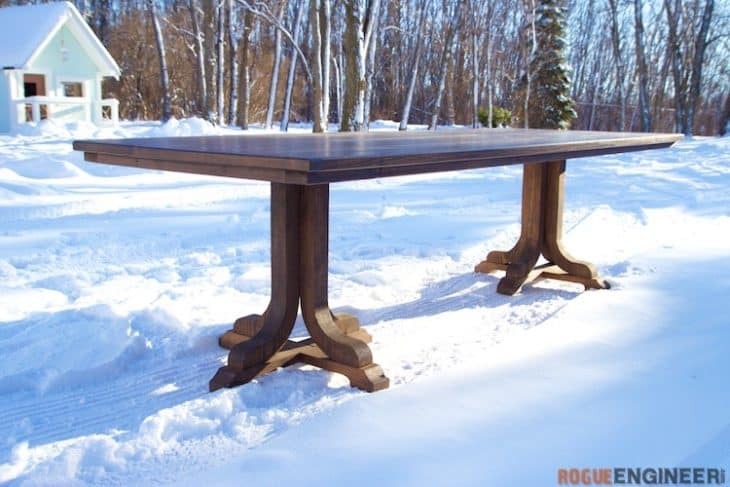 If you`ve found the farmhouse table plans below interesting we invite you to check various other free woodworking plans, we have curated lists that will show you how to build a small cabin, greenhouse, porch swing, fire pit, garage, cat tower, a rocket stove, tiny house, duck house, deer stand, bat house, diy tree house, cat tower, porch swing, pole barn, rabbit hutch, diy dog bed, a playhouse, a chicken coop, a coffee table or a gazebo. 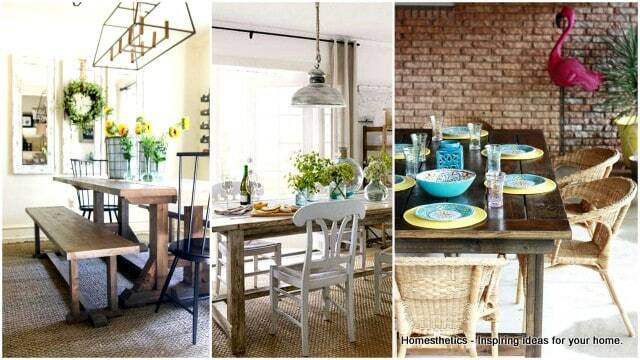 It is always good to have a farmhouse table that is big enough to make the guests feel more accomodating. Moreover, as the table has the capacity to hold quite a few people, you have that luxury to welcome your guests for lunch or dinner together. 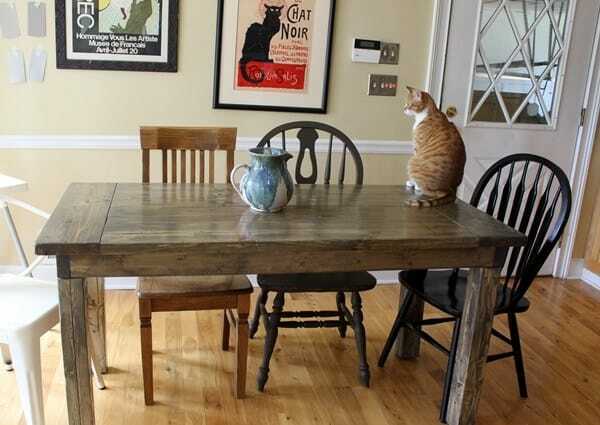 The bench with this farmhouse table makes it comfortable for sit hours for either a chat or a meal. The supplies can be readily available and are also, inexpensive (costing around $100), but the process of building this farmhouse table consumes a lot of time. You have to do a lot of precise notching when it comes to joining the leg pieces together, but once that work is done, the rest of the work can be done easily. 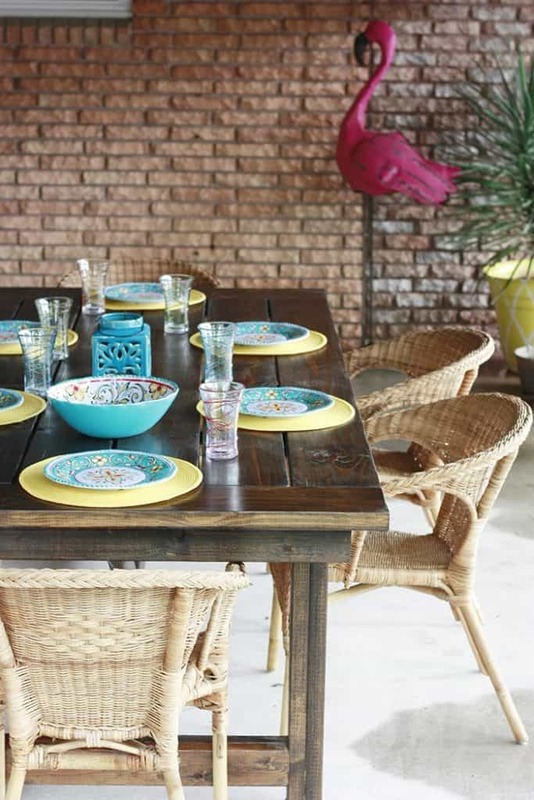 If you that space or a large family to sit 8 people dining together, this free DIY plan from Decor and the Dog is perfect for you. It gives that traditional and rustic appeal to your space. This table is 96 inches in length and 42 inches in width. Also, it stands 29 inches off the ground. These instructions of DIY Farmhouse Table Plans are very to follow with all the illustrations included. The materials can also be easily got to build this magnificent table. 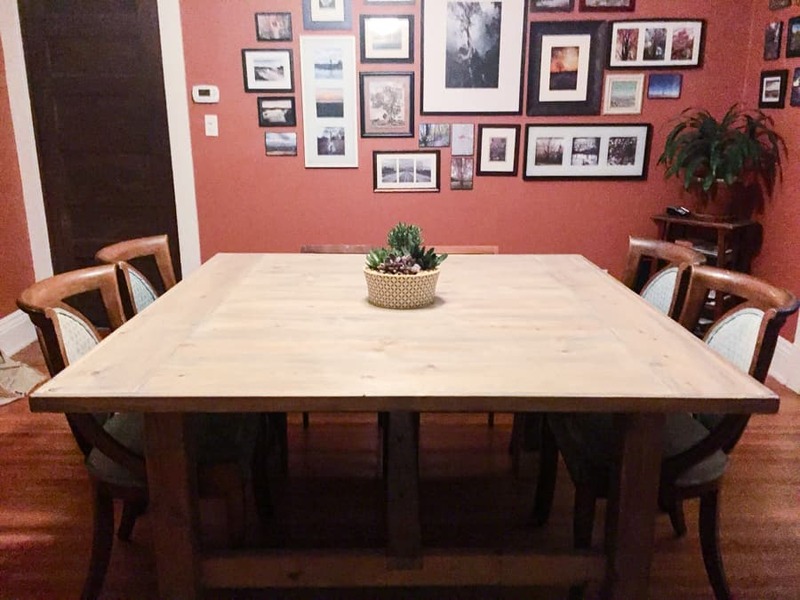 This free DIY plan of farmhouse table is extra wide and is square. This table is perfect for any special occasions where you need a wide space for dining and also keeping a variety of foods or gifts. 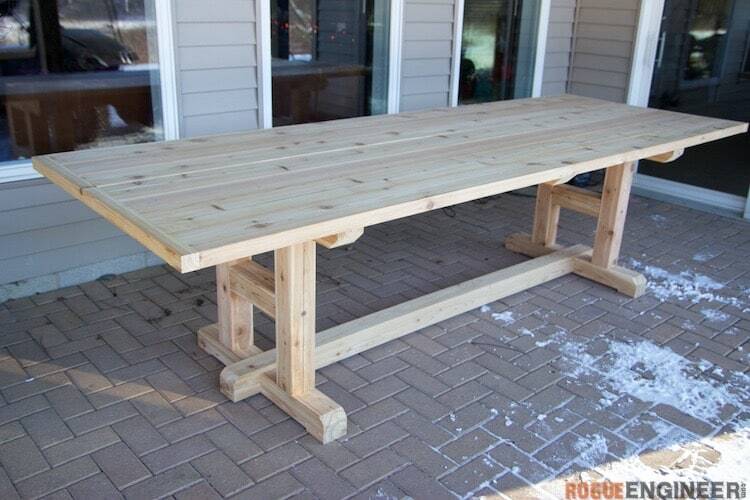 This plan is very easy to make, but you need the space in your room to fit this big table. The materials and tools required to build this table are listed. Moreover, you have a step by step process with detailed illustrated diagrams for good understanding and following. 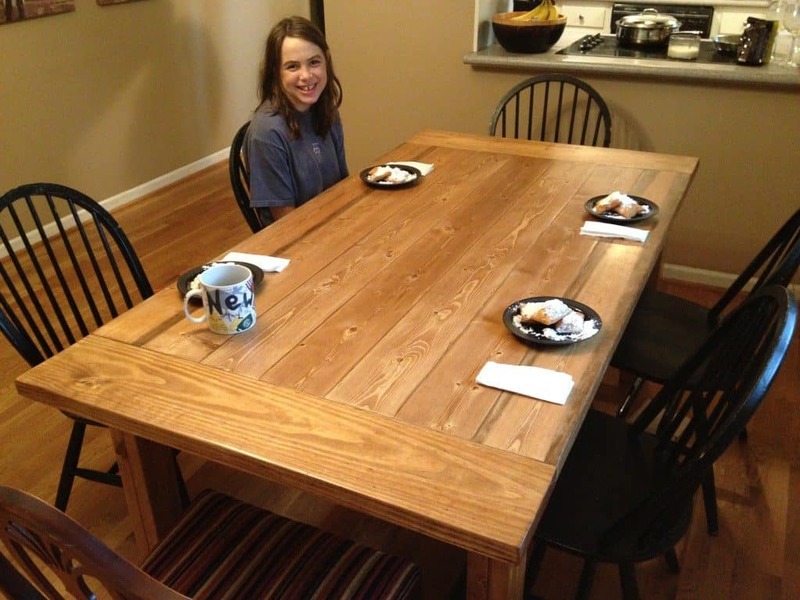 If you are in need of a big farmhouse table, select this plan to build your own. 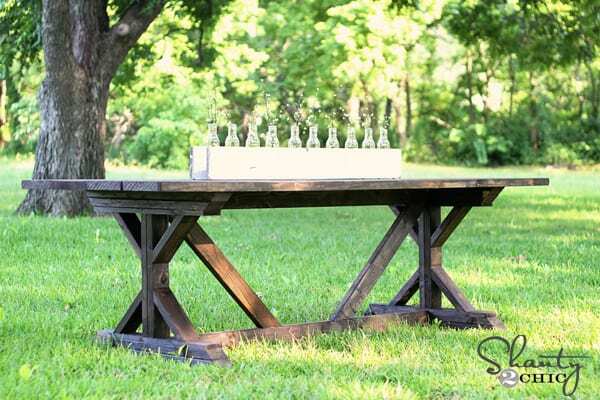 Though not a traditional farmhouse table, it is beautiful in the outdoor living area making it ideal for guests. Also, as the table is big enough to suit any size of family, it makes it perfect for large families or when quite a few guests join you for lunch or dinner. If your budget is around $100 and want to make a farmhouse table that will look classy and fit in a small space, this plan is the best for you. The white legs with a solid wood top provide a brighter feel and are great for a breezy room with many windows. If you have limited space but want to have a full-sized farmhouse table, this table plan is perfect for you and is a gorgeous one. However, this plan requires some carpentry skills, and though it is designed to be thin, it has the capacity for seating six people. A metal pipe is attached to the inside of the legs reaching across the bottom which makes the table sturdy without any chance of wobbling. If you place contrasting chairs, the table looks even more splendid. Many people like benches instead of chairs for farmhouse tables. This gives a traditional classy look and also a rustic design. 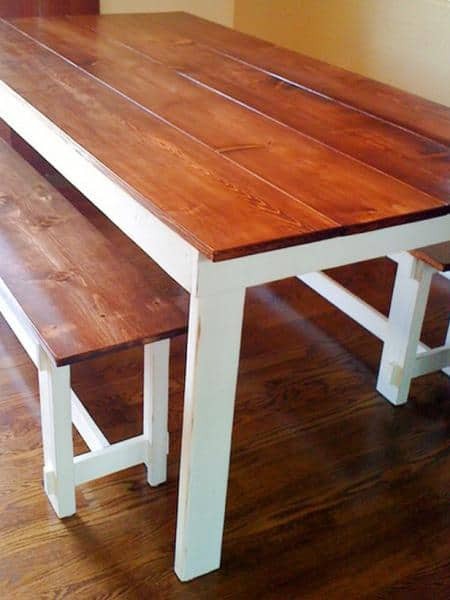 Moreover, the process of building farmhouse tables with benches is very straightforward. This free DIY detailed plan from Love Grows Wild is perfect for you if you have that taste of rustic design. The plan also requires very little carpentry skills, and even if this is the first woodworking project of your life, you can make this table with the detailed instructions provided. With little carpentry skills if you want to manufacture your farmhouse table, consider this free DIY plan. 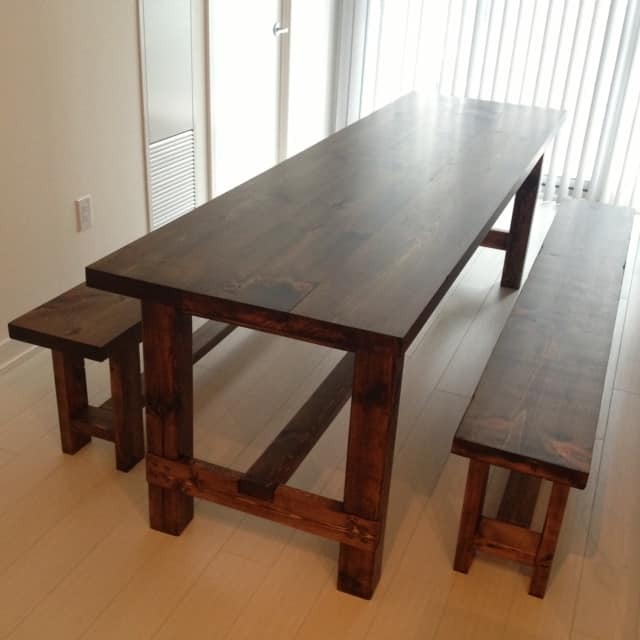 The design is very rustic, and you can easily build this table. 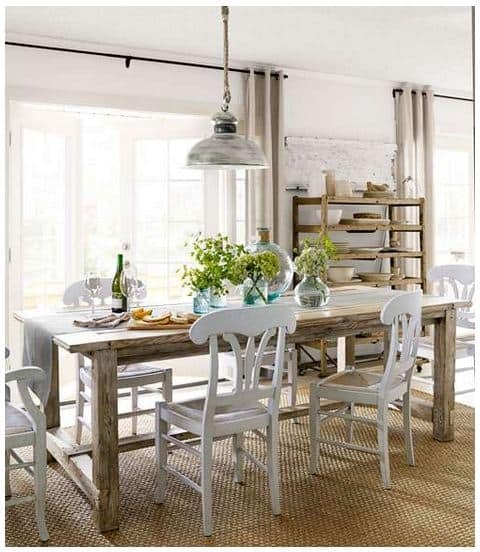 Moreover, it has the capacity to hold quite a few people making it simple table with a nice farmhouse charm. The instructions can be followed easily as they are provided with a lot of illustrations and diagrams. Moreover, you are also provided with a link to view the 3D model of this table helping you to understand the process of manufacturing this table better. If simplicity is your style with a hassle-free manufacturing process of your farmhouse table requiring less time, this free DIY plan from Instructables is another choice you can make to build your table. Even if you are a novice at making tables, this detailed illustrated instructions from Instructables with a list of the materials required will help you out. 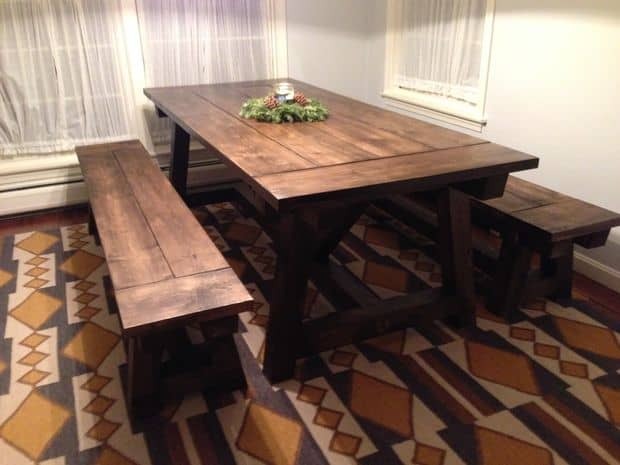 Farmhouse tables are generally designed to be large, but this plan from Addicted2DIY is unique for providing a seating capacity of 10 people. For holidays or parties, if you are inviting a lot of guests, your farmhouse table will be a perfect seating for all enjoying meals together. Of course, you need to have that huge space in your kitchen or living area to keep this table. Though this farmhouse table is extremely basic in design, it has a modern twist with the seating which makes it very attractive. You can modify this table to be trendy or rustic as you prefer and as this design is simple, it is very easy to make. The table is large with the top measuring 51 3/4″ in width and 8’5″ in length. 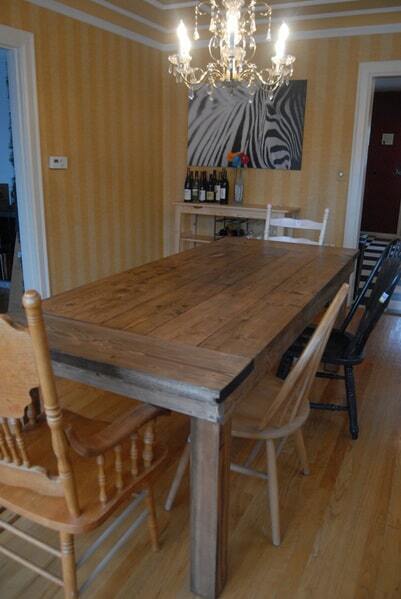 Also, the table is taller than a standard farmhouse table measuring 31″ from the ground. This basic table from Instructables is also very easy to build, and also the benches are simple in design. If you are looking to make a simple table with many seating, you can consider making this table. However, the chairs would require some good carpentry skills or you can buy them separately. It is recommended to use kiln dried lumber which can be readily available at your home store. Check for the initials KD or HT to know the type of lumber to be used. This is another very basic design to build provided by Craft Remedy. However, the chairs might require some expertise in woodworking skills. 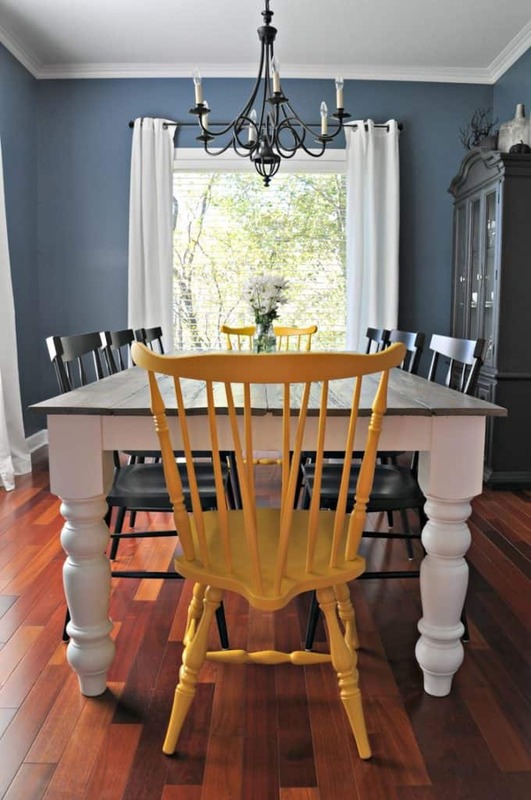 The painted legs and the wooden top adds character to the table. 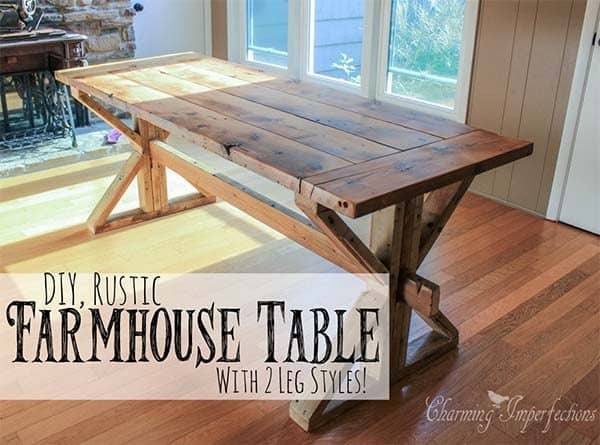 This is another easy to construct DIY farmhouse table plan provided by Charming Imperfections, and you can choose from the two different styles of legs. 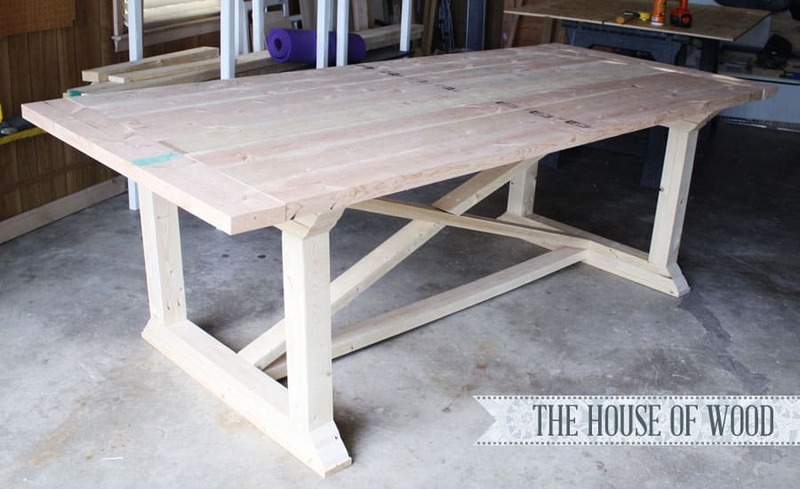 Just, follow the instructions step by step to build this farmhouse table. 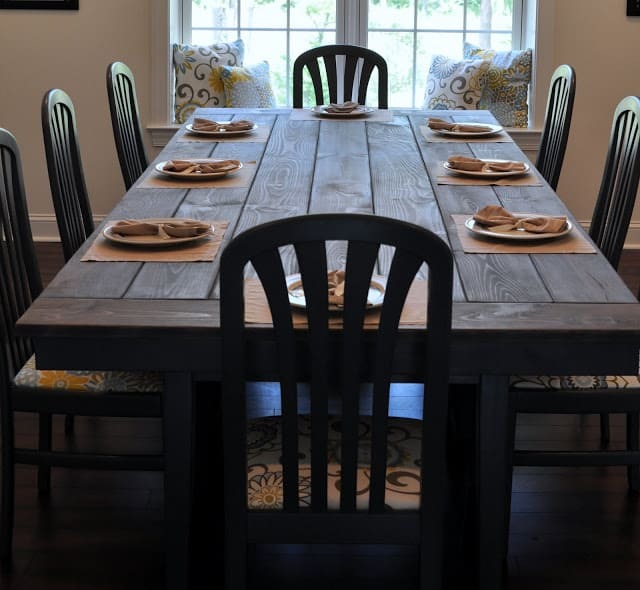 If you are looking for a simple design for making your farmhouse table where you can have additional space to make more people sit, this plan could be ideal for you. The benches give you this option to allow a few more people to squeeze in. This table fits excellently in your contemporary space. This plan can be executed by any beginner, and you are also provided with square sized table and benches. 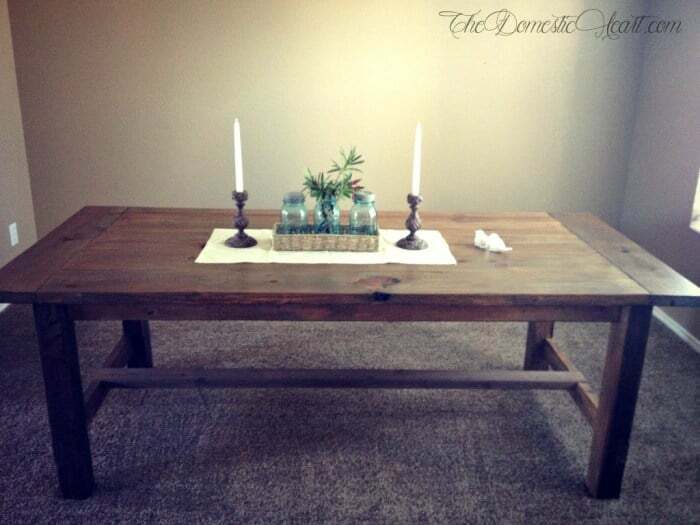 This farmhouse table is one of the sturdiest tables that you can make. It can fit in smaller spaces but has ample space for seating four people. You can also fit in six people if you want. The benches provide that extra space and also they look great. The plans are very easy to execute. Solid oak wood is recommended for the top and turned wood legs provide a great look which you can build in about $250. 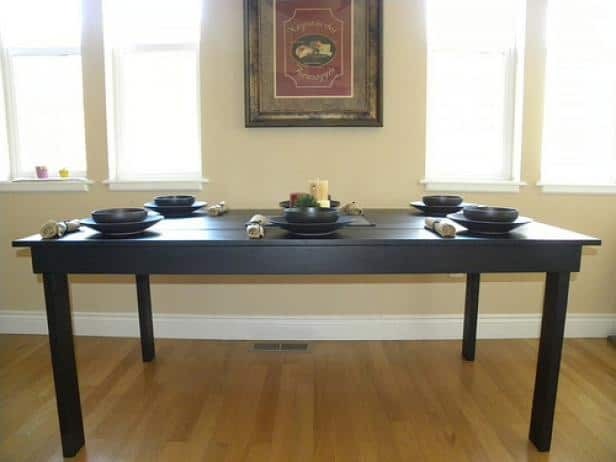 If you have a small space in your kitchen or living space but require a table for dining or if you are fascinated with roundtable designs, you can consider this free DIY plan form Lane Home Co. to be a great option. Not only this table looks nice but also it is very sturdy with layered centered cross base in a V-shape. You might feel the table is difficult to make, but if you have the right tools and carefully follow the instructions, you will be able to accomplish the task easily. If your space is very limited in your living or kitchen, you will love this farmhouse table design which can also be used as a kitchen island. This feature makes it perfect for keeping it in the kitchen space. If you have some woodworking skills, consider making pocket holes without adding 2×2 supports as in the original plan which saves both money and time. In this process, you will not have to drill or cut more holes, and all the screw holes can be hidden providing a better finish. This farmhouse table is very functional and is classic in design which is very popular even among the very modern people. This free DIY plan is provided by Storefront Life. The bench seating allows many people to seat at the table. It allows you to fit in a small area and provide a classic charm to your space. 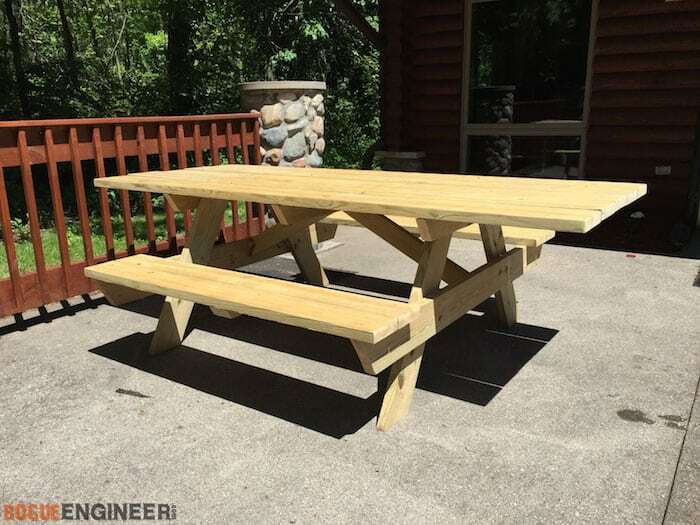 This design is very simple to make, and the plans for the benches are also available. When not in use, simply push the benches inside towards the table which provides you additional space to move around. 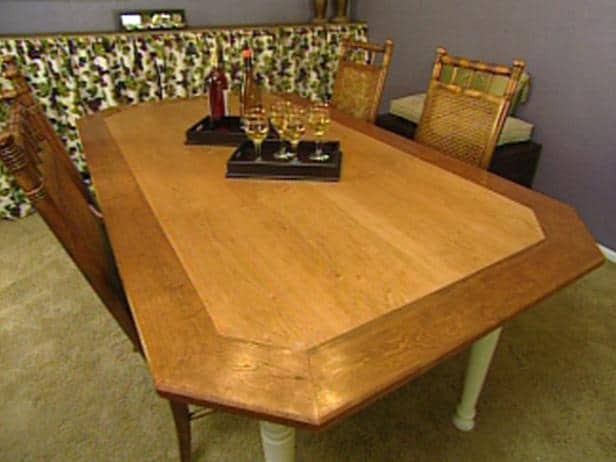 This is another simple table design provided by HGTV which you can make without prior woodworking experience. Though simple, it is gorgeous where you can add decorative chairs to make the look of the set even more attractive. 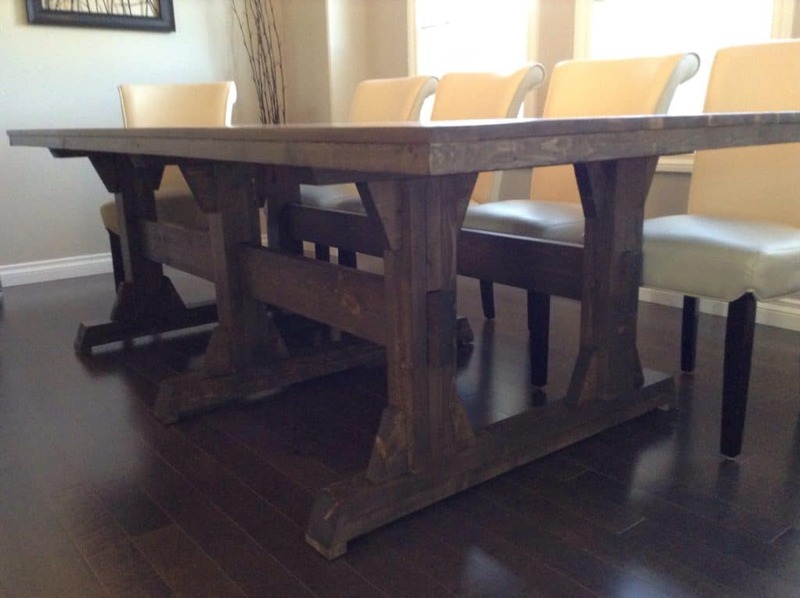 Even if you are an expert in carpentry but want to bring that rustic appeal of a farmhouse table, consider this DIY plan. 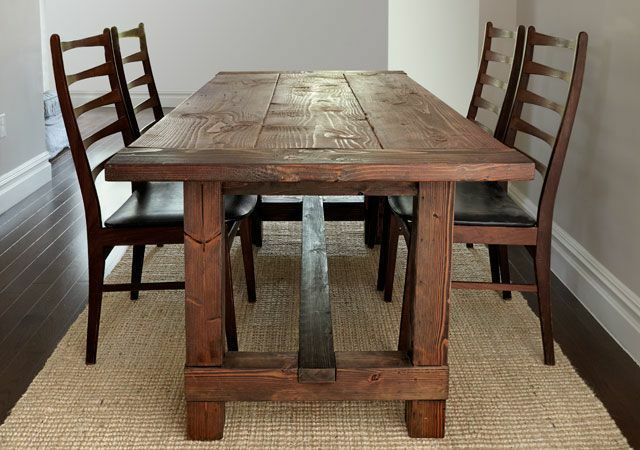 Solid pine wood is recommended because it adds more character to the looks of this farmhouse table. It measures 96 inches in length, 38 inches in width and 30 inches from the floor. 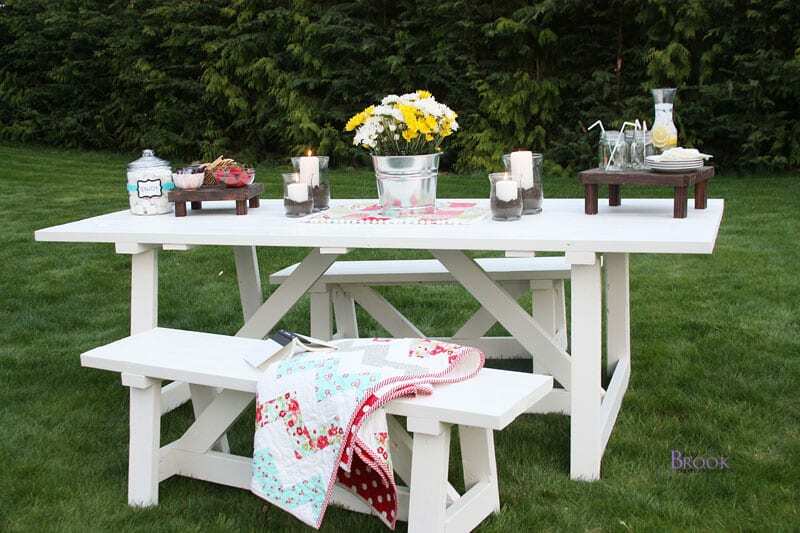 East Coast Creative provides this DIY plan to make your farmhouse table which can be used for a picnic with many guests. This gigantic table can fit 12-14 people. Though it does not have benches, the top of the table spreads out like a traditional picnic table. You can add chairs of your choice and so, if you want to add a modern twist, simply choose chairs with modern styles. HGTV comes with another easy-to-build farmhouse table plan. If you want to go out of the box to make an octagon shaped farmhouse table, this plan is best fit for you if you are not an expert in carpentry. This table adds character to your space if you don’t like the conventional rectangular or square shaped table. 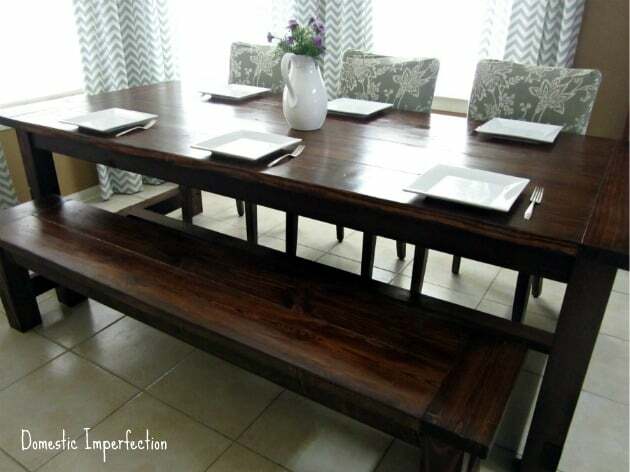 If you want a large and beautiful farmhouse table in your dining room, you can go with this DIY plan from Domestic Imperfections. All you need is pine planks to make this beautiful table with lots of functionality and also, the design is easy-to-build. Though it is said to be a six-seater, you can add at least two more chairs to make nine people sit comfortably. The 2X10’s and 2X12’s top is bound together by pocket screws and wood glue providing stability. 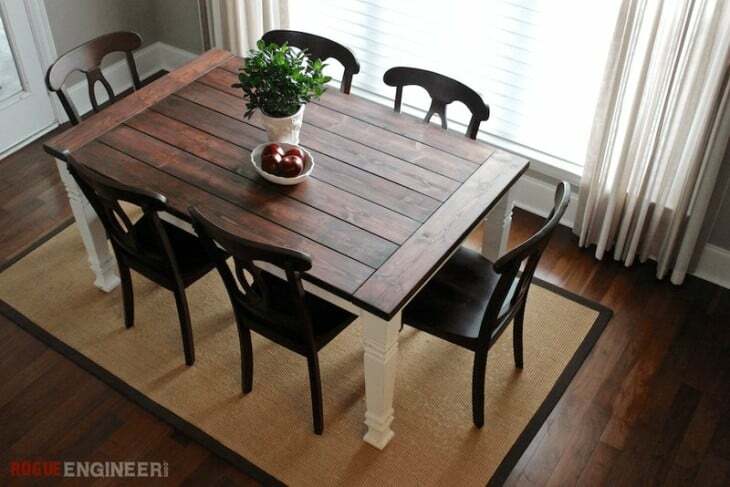 This farmhouse table can actually be built with a budget of $65. It is one of the most beautiful furniture you can make which you are sure to love in your kitchen or living space and is extremely sturdy with all the supports. You can boast of this great design if you are celebrating parties with a lot of guests. Just follow the instructions carefully and tools required to make this table. This design is very simple and very easy to make. If you have a budget of $100 and want a farmhouse table for your regular use, this DIY plan is ideal and adds charm to your dining space. Moreover, this table serves the best for a family of any size. This DIY plan from Ana White is very easy-to-build. The table is very large which has a seating capacity of at least six people. You can even make arrangements to allow two more people to sit. 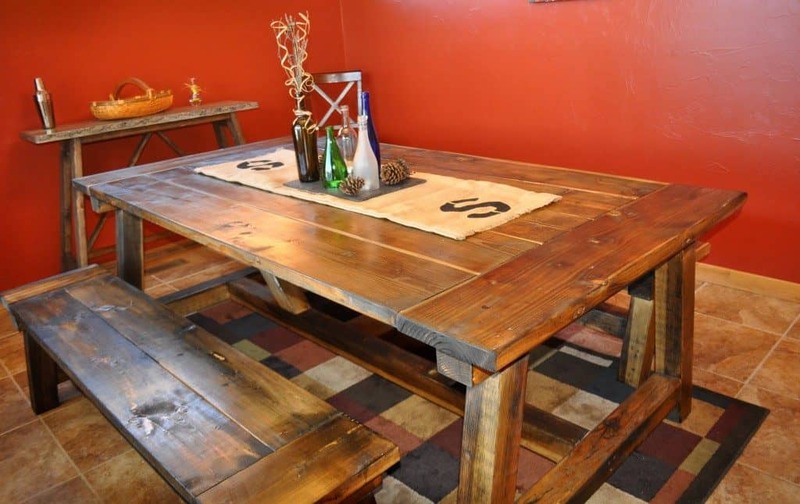 This rustic table is extremely sturdy and durable. 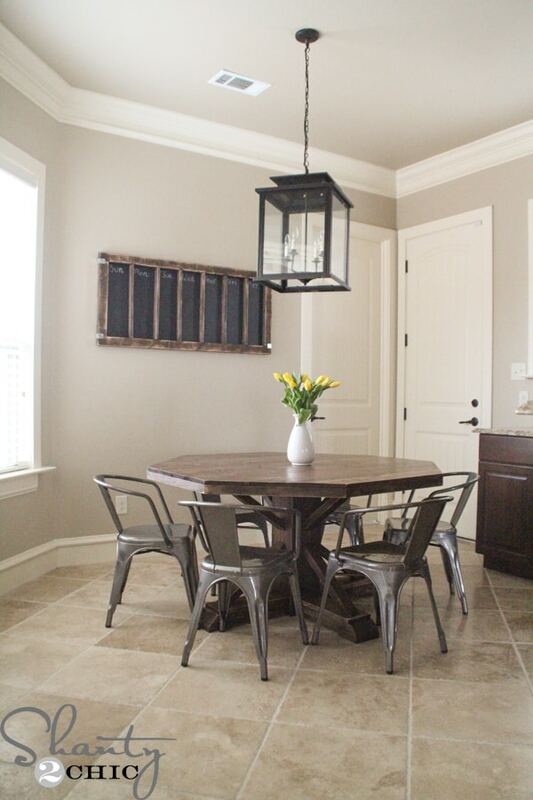 If you use contrasting chairs with this farmhouse table, it sports a unique look to your space. 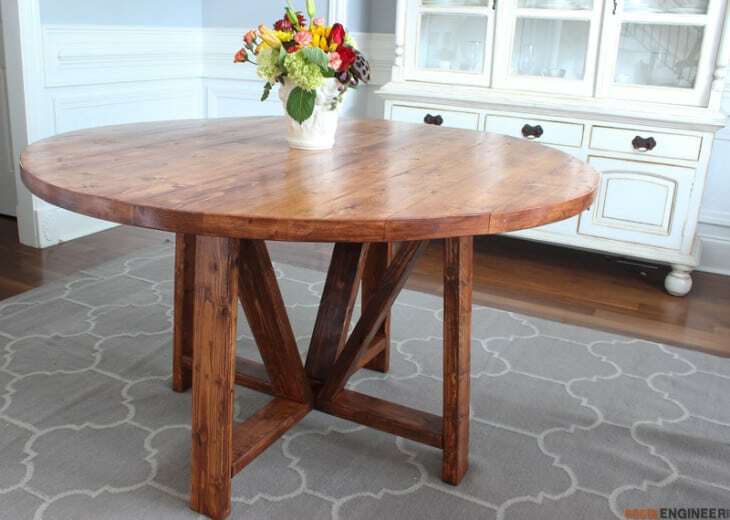 One of the most elegant farmhouse tables that can add to your space is this simple design. 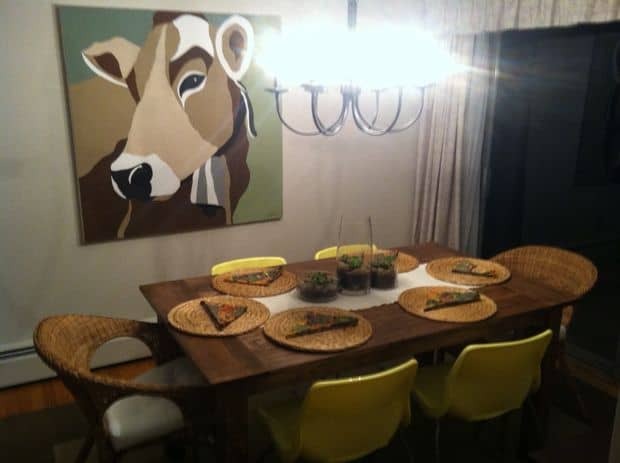 If you have a large dining space, you can make this rustic design. At least ten people can sit together at this dining table. The dimensions of this table are 96″X41″. 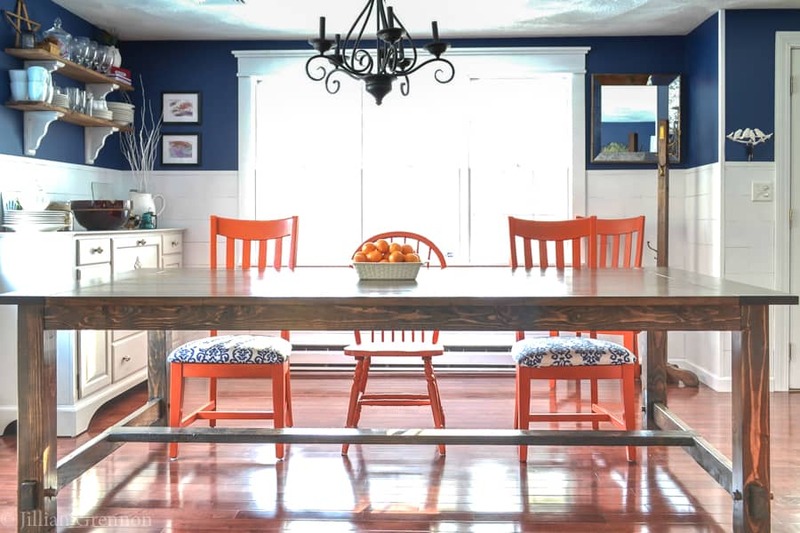 The bench and the chairs add character to this farmhouse table. Simply, follow the instructions step by step and shop for the materials required to make this beautiful piece. Kiln-dried pine wood is recommended for this table. If you don’t have a large space for dining, you can check this plan. 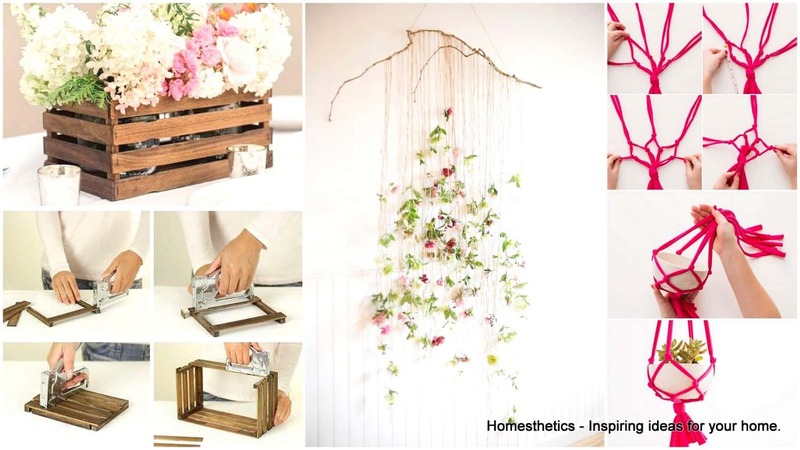 This design from Instructables is very basic to make and can easily fit in your small space. However, it has the capacity for six people to sit together at the table. The cost depends on the type of lumber you are using; construction grade pine wood might cost around $50, and if you are using furniture grade lumber, it might cost approximately $120. This design looks extremely stylish which you will want to sport in your kitchen or living space. However, you might think it will be difficult to make this stylish three pedestal table but stay rest assured, even if you are a novice at woodworking, you can create this project with ease. The design is extremely simple to make and brings a charming feel to your room. 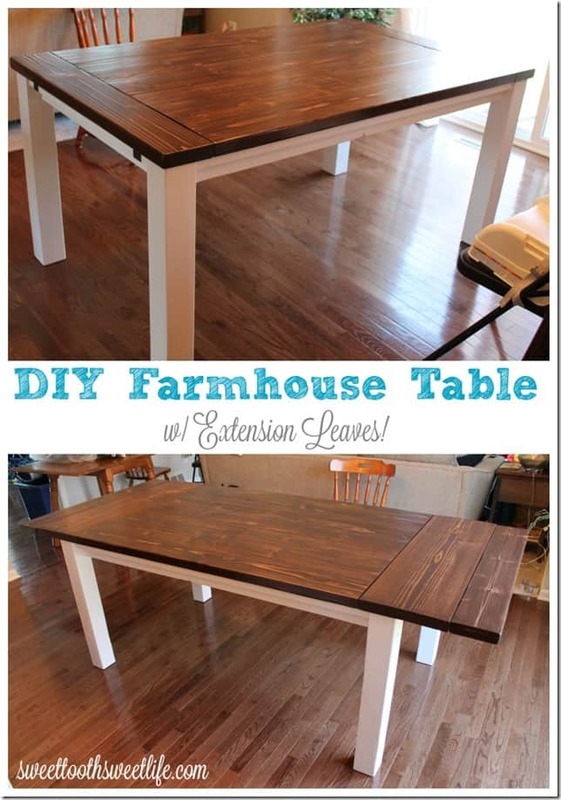 This rustic farmhouse table comes with an extension leaf making it extremely functional. When required, you can extend the two end pieces to add extension leaves for additional space on the table and when not in use, simply slide it in. It will cost you around $230-$300 based on the materials which you already have. Though it requires some carpentry skills to get the job done, you can also do it with attention to the detailed instructions provided if you are new to woodworking. If you are a beginner at woodworking but want to create a masterpiece with your very first project, consider this plan. Though very simple, it looks great when finished, and as it is large, it makes the table very functional. 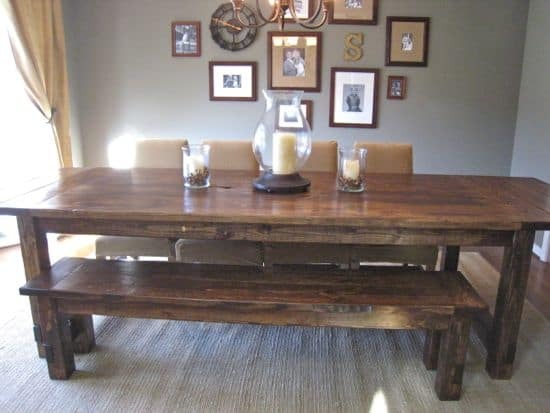 As you hear the term “farmhouse table”, you think about a traditional table. Moreover, if you like the traditional style of your furniture, this is a perfect DIY plan from Popular Mechanics for your farmhouse table. The design is very basic, and you can easily make this table even if this is your first woodworking project. The detailed instructions with illustrations are provided along with the materials and tools required to accomplish the task. This table offers enough space for at least six people to sit comfortably and it will be one of the greatest additions to your dining space. 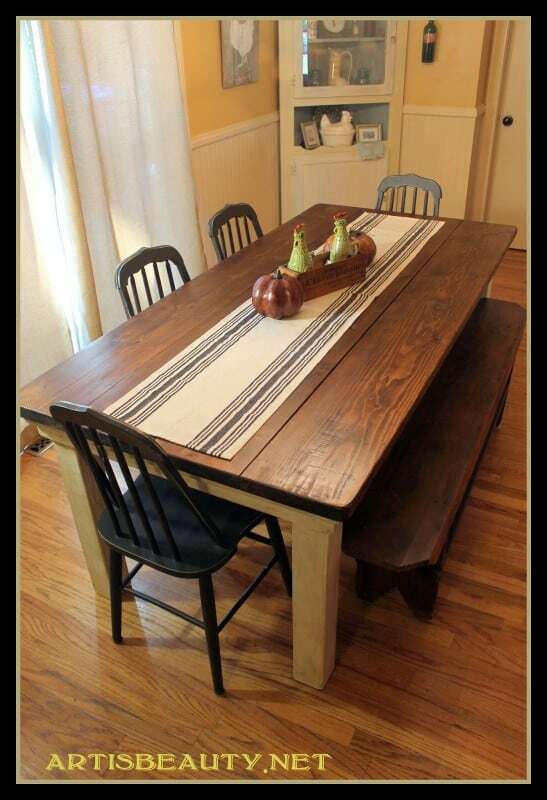 This is another basic farmhouse table design which you can easily build. However, the table is large with a seating capacity of at least ten people. This table is also a great addition to be in your home as it serves many purposes including storage apart from dining. The instructions are provided in two separate parts; first part includes the construction process and the second part includes the finishing touches. This rustic farmhouse plan from Rogue Engineer blends perfectly with the contemporary style, and you can make this very easily. It is a perfect dining table where six people can sit comfortably and is a wonderful addition to your dining space. The white legs contrasting with reddish brown top and chairs gives a splendid look. 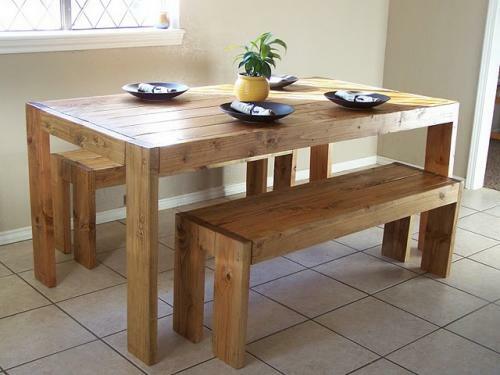 This is another very simple and traditional farmhouse table which is extremely strong and durable with no wobbling. Also, from the very look of the table, you can understand that this project will be very to make. This plan has been inspired by Ana White’s DIY plan and modified by DIYPete making the design a unique one. The two benches make the table look simpler and also provide ample seating capacity. 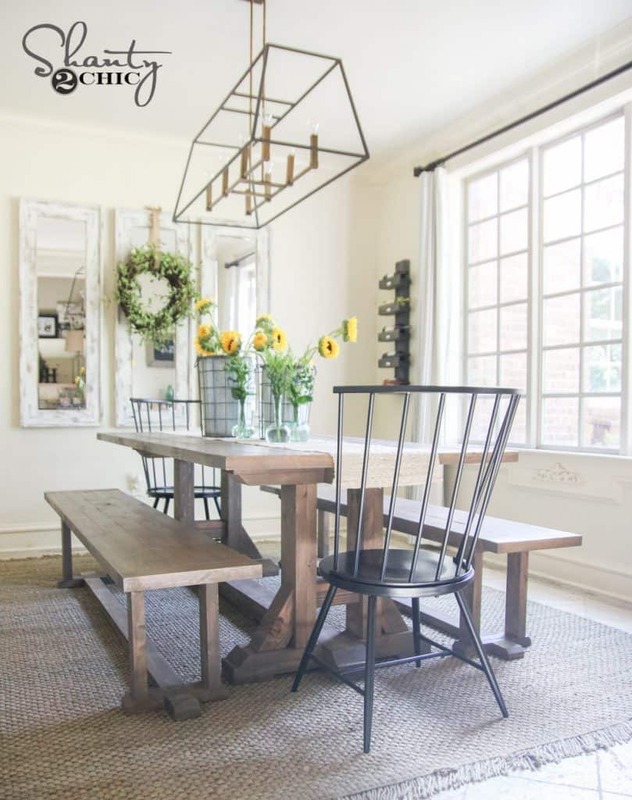 Inspired by a Pottery Barn farmhouse table, Shanty-2-Chic provides this free DIY plans for free which will cost around $100 to make this stunning table. They feature two benches, and the plans have been made simple for building as they are not easy to make for beginners. 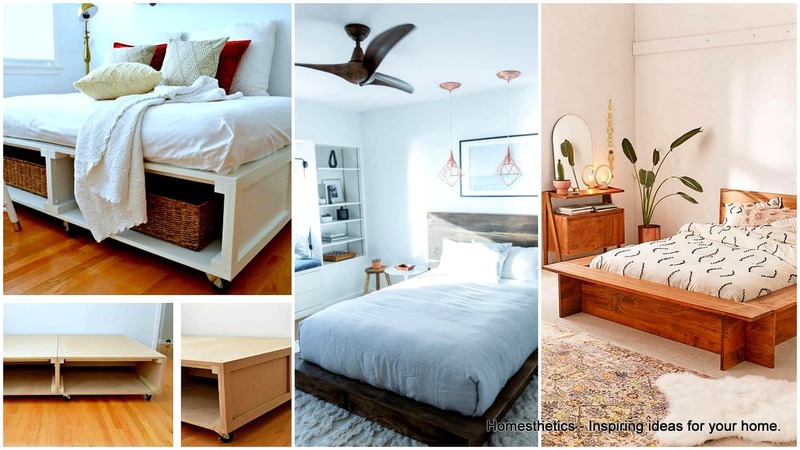 Life Storage has come with a perfect mix of rustic designs and materials with a touch of modern furniture style. The timeless elements and cleanliness give a trendy look. 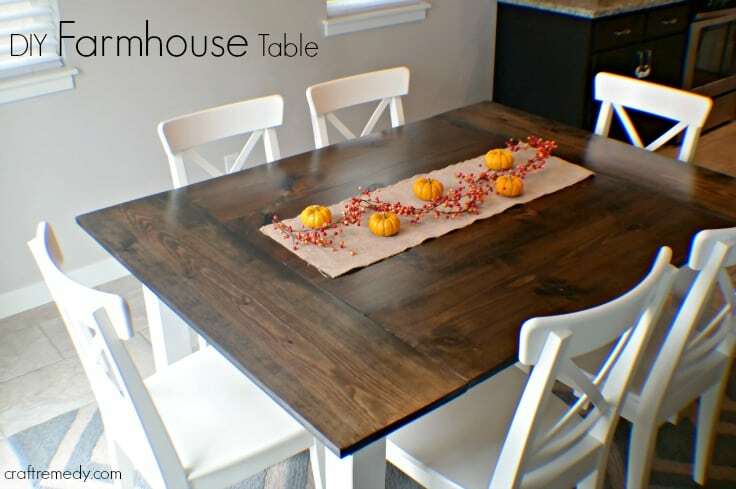 If you can afford $300 for a farmhouse table, this free plan is ideal for you. 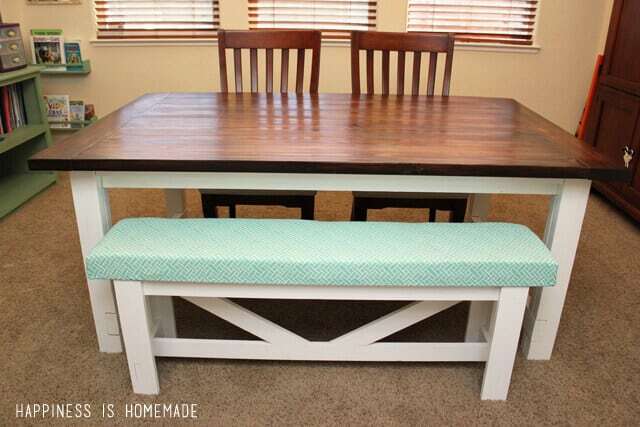 Even if you are a beginner, you can build this 10-seater farmhouse table which acts for storage as well. 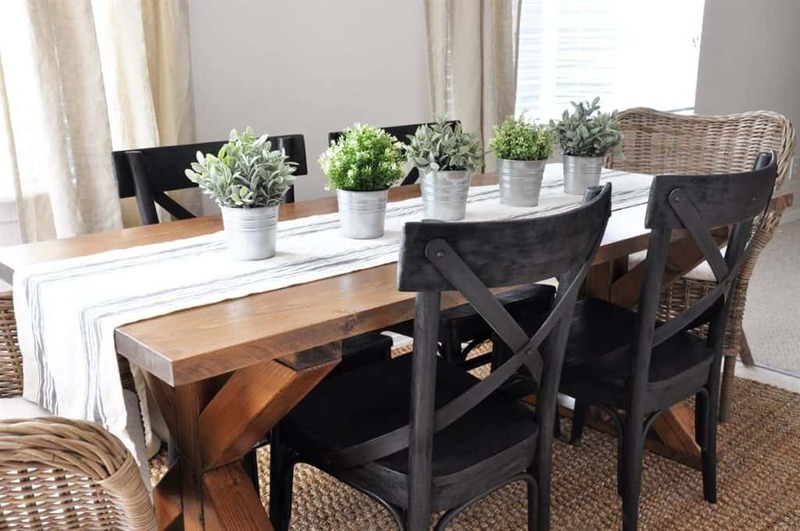 This free DIY plan from Ana White is a rustic design yet stylish. The X-cross support that the table has adds character to the table and also, provides great support making the table more durable. Simply, follow the steps as mentioned and you get the project completed easily. However, you need to have the right tools to do it. This is a beautiful and straightforward design which you will find this DIY plan ideal for beginners. The legs are very simple and use contrasting colors like white legs and reddish brown top to make this rustic table look splendid. 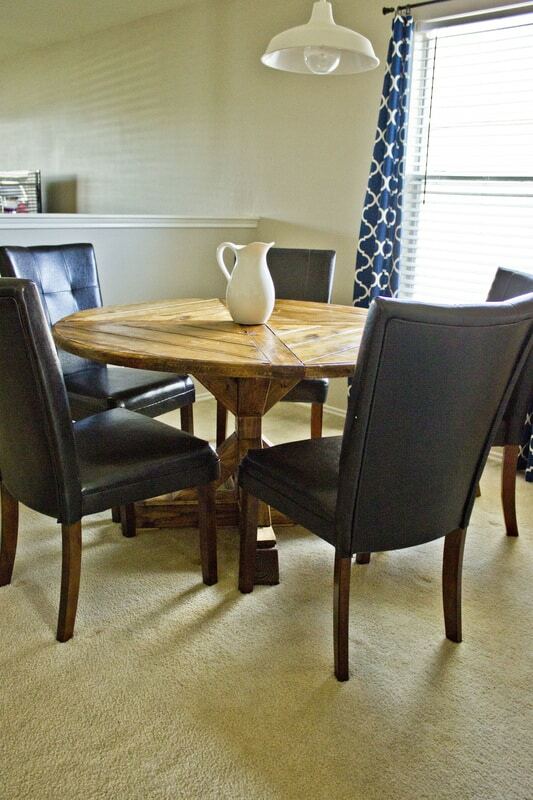 If you like a large octagon table instead of a simple round table, you can consider this free DIY plan from Ana White. This table features truss supports and pedestal base which makes it extremely durable and stable. The look might unnerve you because of the angle cuts, but you can easily get this task accomplished with the right tools. The entire list of the tools and materials required are provided. Also, the instructions are very easy to follow with illustrations included. The table has the capacity for seating six people, and it can be manufactured with a budget of around $110. 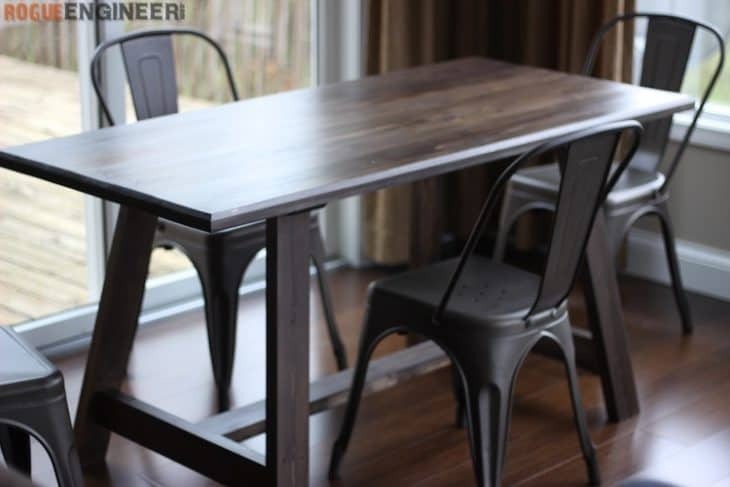 If you do not have a high budget or want to save money, you can easily follow this simple plan to make this farmhouse table and fit into any space. 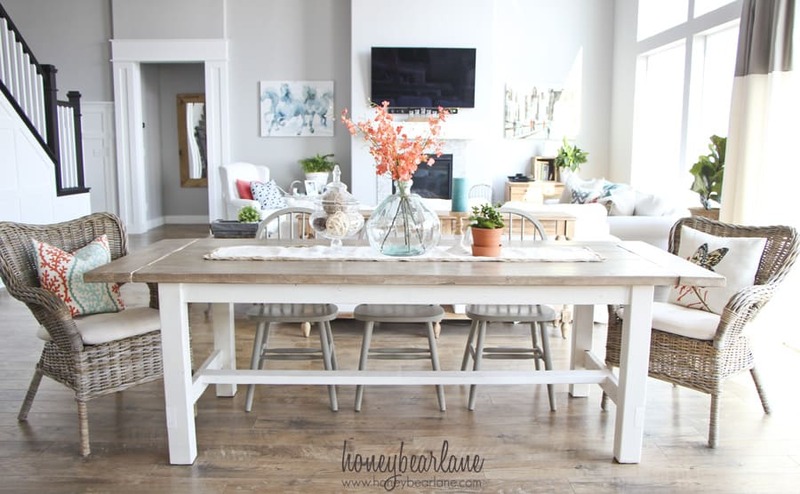 Farmhouse tables with turned legs are very much in trend. 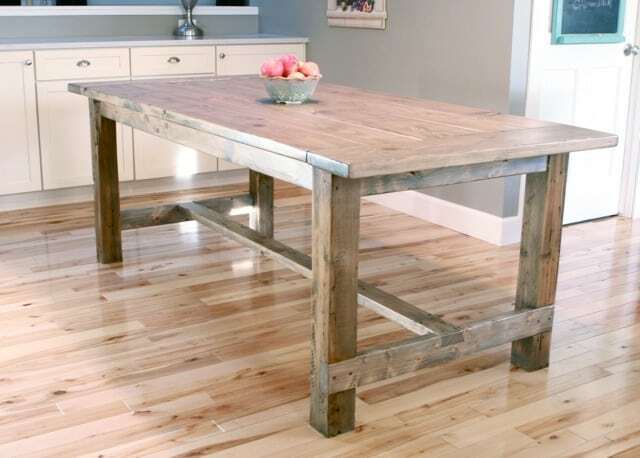 Moreover, the simplicity of the process of building this farmhouse table makes it even more popular. 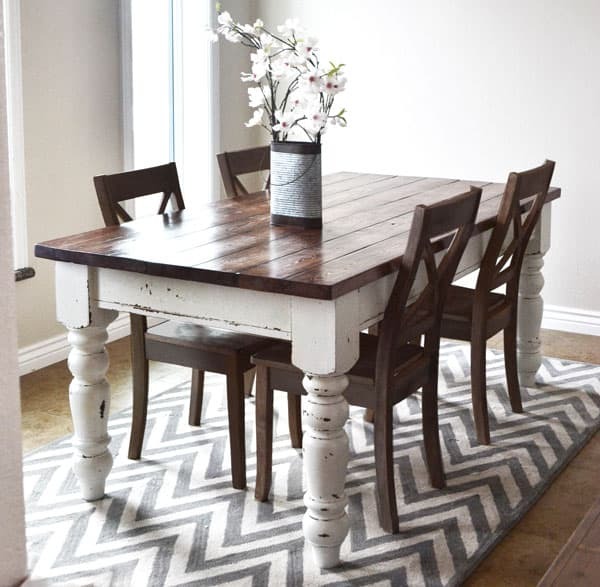 Drawing inspiration from the Triple Pedestal Farmhouse Dining Table by Shanty-2-Chic’s, Leave it to Joy built this fantastic table. You will be fascinated with the large size of the table providing substantial space for keeping other things for storage as well. You can build this table out of 2x6s or 2x4s. You can make this table with a budget of around $100 from solid wood which makes the table extremely sturdy and durable. The inspiration was drawn from Restoration Hardware Provence table, and Anna White provides this plan with a little twist. The project is very easy to complete from 2x4s. 4x4s are difficult to find and also expensive. Moreover, you will find it difficult to cut and join 4x4s tending to warp. If you are a starter, this is another design you can consider to build. The step by step instructions provided by Boxy Colonial are easy to follow, and the list of materials and tools are also provided. 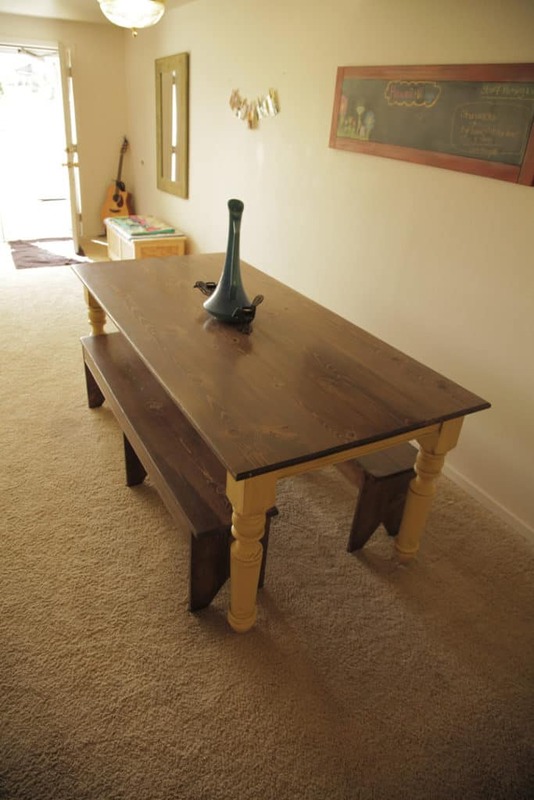 This farmhouse table can be used for any purpose like reading or writing, playing cards, eating, or any other activities where you need a table. Six people can easily sit at the table together. 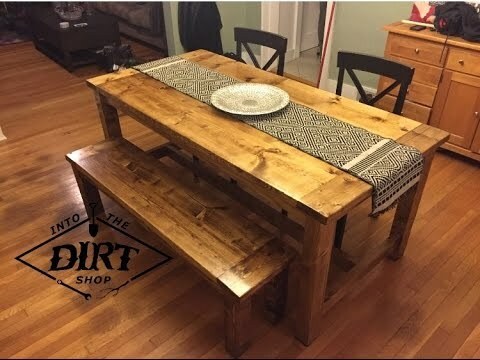 If are in need of a farmhouse table but this is going to be your first woodworking project, or you are very much new at making furniture, this free DIY plan is best to try out. 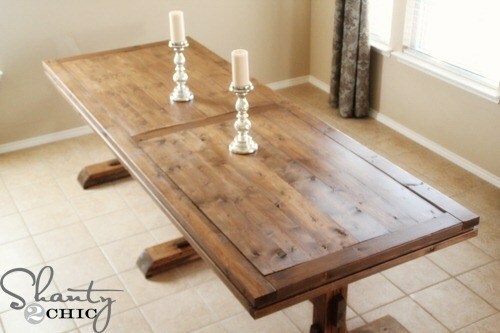 This is arguably the easiest dining table you can make and has a rustic look. This table is designed to be gorgeous. The table might look challenging to build, but if you follow the plan, it is very easy. If you check Step 1, you will find that cutting the joints can be done quickly and a 4 x 4 X-leg can be built with lap joint. This provides stability and durability. Moreover, the herringbone top makes the table even more beautiful. 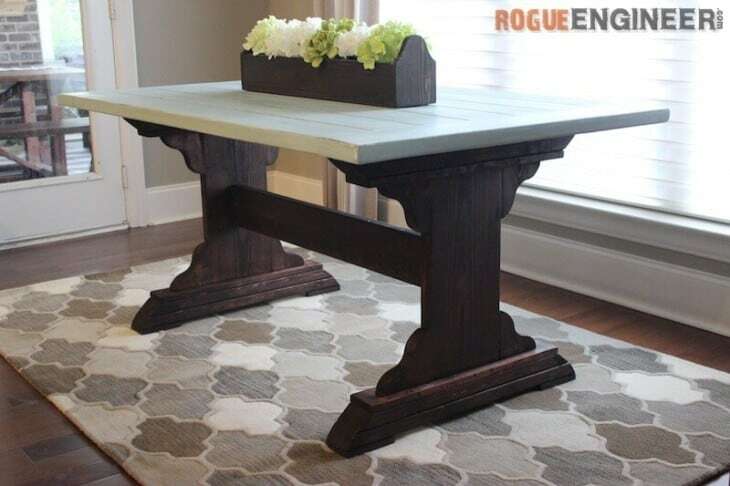 Inspired by a monastery table, Rogue Engineer has provided this free DIY plan with some modifications to make a beautiful dining table which can also be like a farmhouse table. With this special plan, you can add a soothing feel to your space. Drawing inspiration from a round trestle table that was worth $3350, Rogue Engineer came up with their free DIY plan to make the table cheaper. Unexpectedly, you can make this excellent table for around $40. 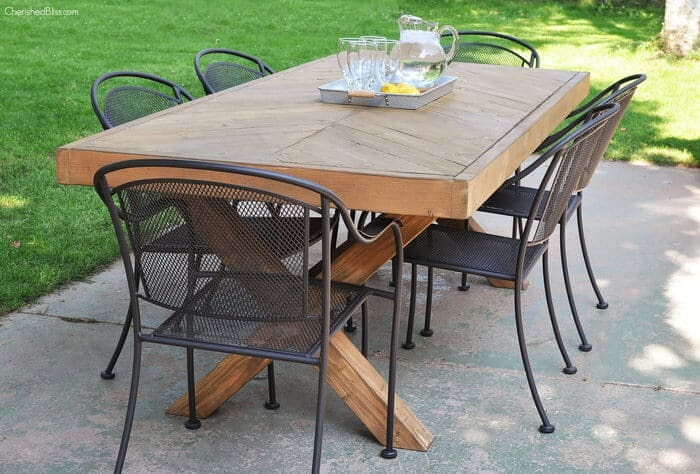 You may think that round tables are difficult to build, but if you have the proper tools and follow the instructions carefully as provided, you can actually make this table with ease. 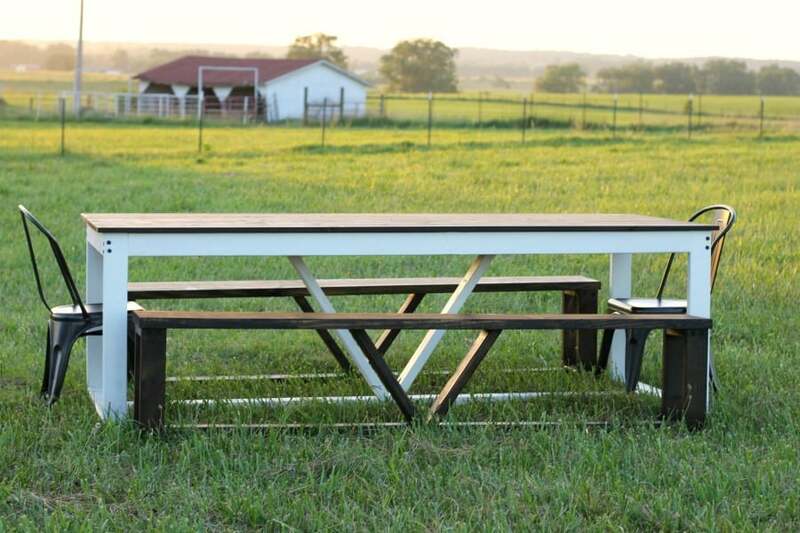 If you need a farmhouse table that can also be used in a picnic but needs to have the option for someone who needs to sit on a wheelchair, consider this free DIY plan to build your table. This feature makes the table very versatile. You may think it might be difficult to make, but the instructions are very easy to follow. This free DIY plan is primarily designed for use in outdoors especially in the springtime. Cedarwood is recommended because it can withstand the natural elements and the boards are designed to have gaps between them so that it allows drainage. If you want to make an indoor farmhouse table with this plan, simply use the top design as used in the J-pedestal table and do not keep any gaps between the boards. If you are looking to make a large table for dining or celebrating ceremonies with many guests, the J-pedestal dining table can be a great choice. The design was inspired by a Pottery Barn. This gorgeous table adds class to your space which your guests will also praise. Though the materials can be purchased at affordable prices (costing around $125), you need to have good carpentry skills to make it and also the process is time-consuming. Southern Yellow Pine is recommended to use for the top because not only it is inexpensive but also it is strong and durable. 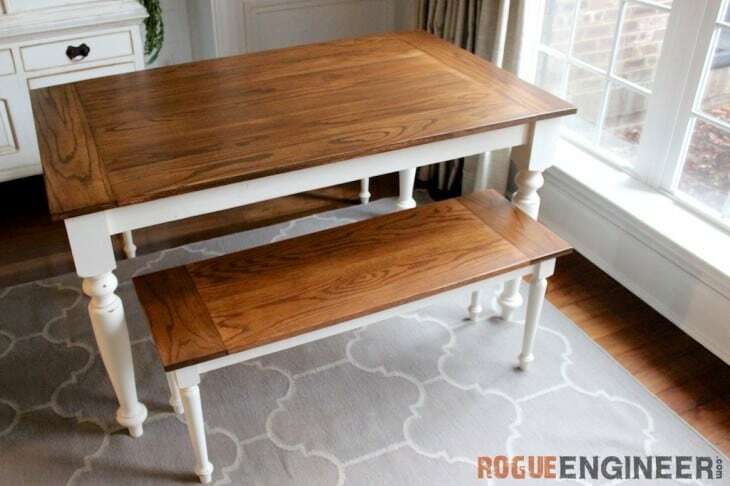 If you want a small farmhouse dining table with an interesting style, this DIY Farmhouse Table Plan from Rogue Engineer is brilliant to try. The design comes with a simple base but has double angles making it interesting. Though the dining table is small, it can easily accommodate four people in a narrow area. Even six people can also sit closely. You can modify the design for a wider or longer table by simply lengthening the required pieces. Now you have the knowledge of creating your dream farmhouse table of your choice. 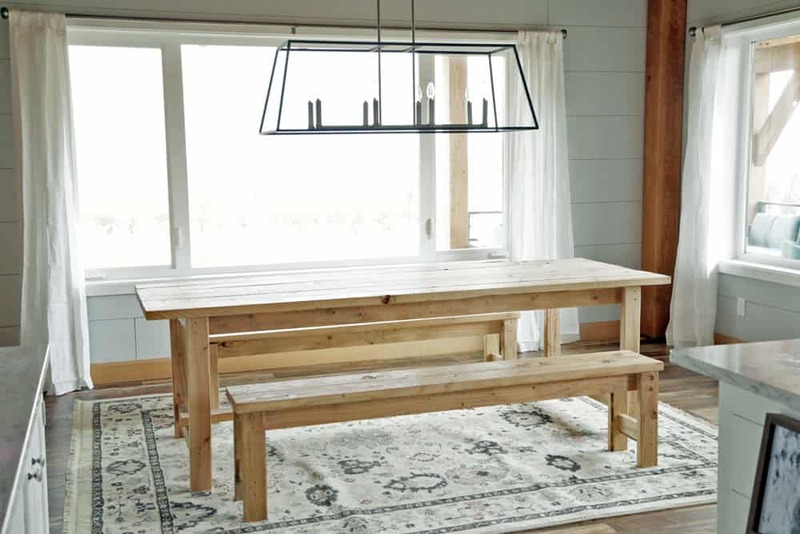 With 53 DIY Farmhouse Table Plans, consider choosing anyone which you like. Even if you are not an expert at carpentry, you can select from the simple designs that are equally stylish. If you are great at woodworking, you can consider the projects which require some expertise. 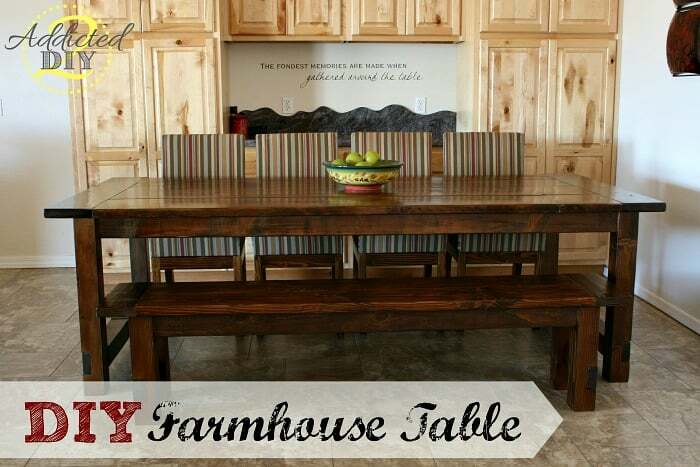 Undoubtedly, farmhouse tables are very functional that is a great addition to your home furniture.